This week I have been de-cluttering the house. I have managed to get rid of a few large items which were space hogging as well as a few little items. I placed some on Ebay so now I will be able to get Maxwell some small treats with the money I made. Maxwell enjoyed helping me on the clean up and has learnt how to clean a floor with a wet wipe, put his plates away, put his toys in his toy box and puts all his bath toys away after his bath. I have been trying to encourage Maxwell to eat new foods this week. With a little help from Kerry over at Ohsoamelia, Maxwell has tried waffles with strawberries, grapes and a few magic stars for breakfast, noodles for lunch and smoothies in the day. Maxwell enjoys fruit however he was a little wary of the waffles. I hope he grows to like them. 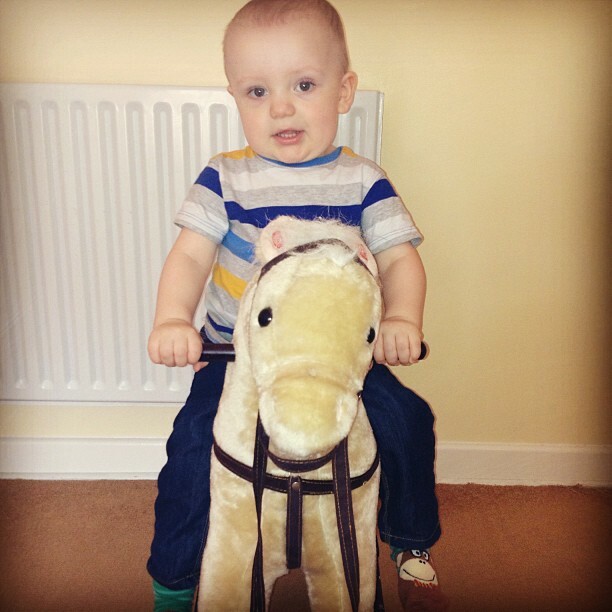 Last Christmas I bought Maxwell a rocking horse. For many months the rocking horse gathered a lot of dust as Maxwell was too small for it and couldn't grasp the fact he had to sit on it and rock on it but this week he showed a interest in it and has become a professional cowboy overnight. He has been playing on it every day this week and enjoys watching Cbeebies whilst on it. Maxwell has got a little bossy recently. If I am doing something, he demands my attention and has even taken to pulling my hand away from what I am doing to give me something such as a book to read to him. If I do not meet his demands he can end up getting very cross. I hope it is something he will grow out of soon. Maxwell was lucky enough to visit Gunwarf Quays this weekend and we managed to pick up many bargains for him. We got 2x Gap tops RRP at £10 each and we managed to get them for £2.20 each, 2 French Connection tops RRP at £20 each and we got 1 for £3 and the other for £6 and we also purchased some stickers for just 35p to go in his craft box. Maxwell enjoys shopping and I cant wait to go again soon to hunt some bargains down. I think being bossy is a toddlers prerogative!